I’m a big fan of “Big Al” Tom Schreiter. I’ve read most of his books and studied most of his training materials. I personally think “Big Al” is the # 1 trainer in our industry. 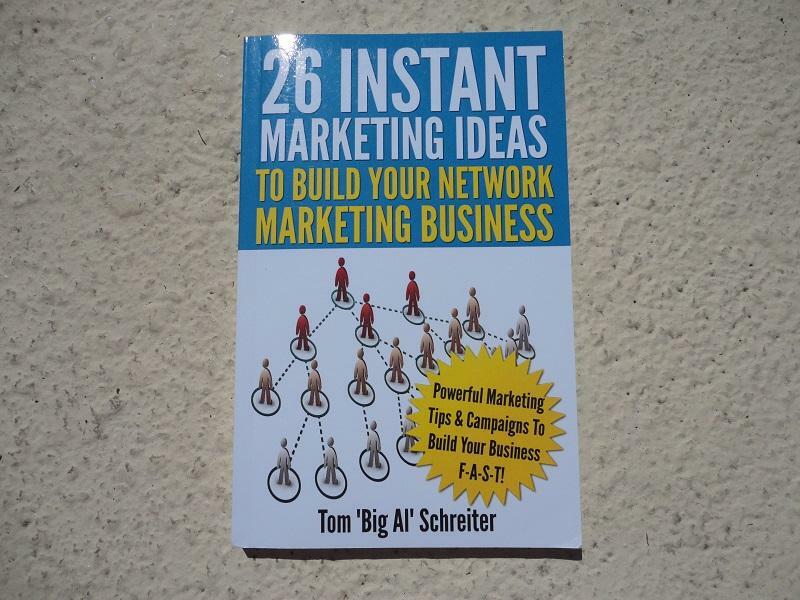 I recently picked up a copy of his book titled “26 Instant Marketing Ideas to Build Your Network Marketing Business.” I enjoyed the book and definitely recommend it. Overall, I give it 3 of 5 stars. There are a few things that I really like about Big Al’s books. First and foremost, Big Al knows what the heck is talking about. He’s been in our industry for decades and he is filled with so much knowledge and wisdom. His writing is to the point, funny and easy to read. This book is no different. What I would like to do in the paragraphs below is just share a few of my favorite quotes from the book. The quotes are listed in no particular order. Each quote is in bold and italics. After each quote I will share my own thoughts on the subject. # 1 Prospects will choose to remember only bits of our presentation. No one will remember everything you say during your presentation. That’s why it is important to be short and sweet and to the point. Focus on the key points during your presentation and do not overwhelm your prospect with information overload. Just remember that less is more! # 2 Write down all the great features and benefits about your program. Features tell and benefits sell. Know the benefits of your products, services and company. In other words, what do people gain by using your products or services? How will people look or feel when they use your products? # 3 You’ll have to look very hard to find a prospect today who will sit through a one-hour or two-hour opportunity presentation. Keep your presentations to 10-20 minutes max. People have a short attention span and most people are busy. Very few of your prospects will sit down with you for more than 30 to 60 minutes. # 4 You build a solid network marketing business by building relationships. This always has been and always will be a relationship business. Relationships are the glue that holds your business together. # 5 People make weird decisions based on illogical, emotional criteria. Appeal to people’s emotions whenever possible. People make emotional decisions and then justify those emotions with logic. Don’t think that being logical will help you sponsor anyone! # 6 A new distributor can write a letter to every friend and relative announcing that he (or she) is going into business for himself. Instead of asking them to join, he can ask each friend and relative to purchase just one product to help his starting inventory. This is a great way to initially contact your warm market in a rejection free zone. # 7 Premiums are anything you can offer as an incentive for fast action. When you are trying to sell your product, service or business opportunity, offer a special bonus or something free along with it. This will help influence more people to buy. # 8 Forget logic and needs. Market to basic human desires. Figure out what people want and show them how to get it. Once again, people are emotional creatures. # 9 If you buy leads or run an advertisement, 95% of those prospects won’t join your program. Most of the people you come in contact with will not be interested in what you have to offer. If you are doing paid ads, you need a way to make money from those 95% of people as well. That’s where a funded proposal such as a tool, affiliate product, system, or leads comes in handy. Use a two-step selling process and back end people into the business. # 10 If you worked hard to get a prospect or a customer, don’t walk away with only a partial profit. Don’t give discounts when you are selling a product or signing someone up. Instead, offer them a low cost, free bonus product with a high perceived value. This is called a premium. # 11 Sharing great deals or great discoveries is as natural as breathing. We are all natural network marketers. Most of us simply don’t get paid for it. We all recommend different things to our friends and family. # 12 In every problem there is an opportunity for a great marketer to make money. Find a problem and offer people a solution to that problem. Recessions are a great time to build your business since more people are looking for a Plan B. # 13 You have to help prospects feel that they want your products, services and opportunity. Put yourself in your prospect’s shoes whenever possible. Get in their mind and learn how they think. Think of things from the other person’s perspective. # 14 When your prospect feels strongly about doing business with you….price doesn’t matter. People like to do business with people they know, like and trust. Never forget that. If your products or services are unique, different and good quality, the price is irrelevant. # 15 Once you know which products sell best, you only have to determine how to upgrade as many prospects as possible to you products. Focus on marketing and sharing your company’s most popular, best-selling products. This book was published in 2002 by KAAS Publishing. The ISBN is 1892366118. It features 176 pages. As of May 2015 it has 95 customer reviews on Amazon with an average 4.7 star rating. It comes in paperback and Kindle format. Big Al is a legend in our industry. He is one of the world’s premier network marketing trainers. He’s spent decades in our industry and has personally mentored thousands of people. He is the #1 trainer in our industry as I see it, and he is one of my trusted mentors. Visit his website to learn more about him. 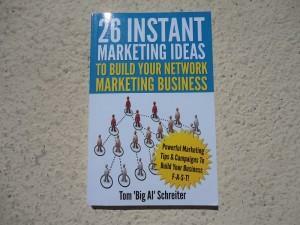 In conclusion, I recommend the book “26 Instant Marketing Ideas to Build Your Network Marketing Business” by “Big Al” Tom Schreiter. I think the book has tons of great tips and ideas that can help you grow your business. If you haven’t read it yet, you should. What are your thoughts? Did you like the book? What was your biggest takeaway from the book? Leave a comment below to let me know what you think. #4 and #6 really resonate with me! #4 ~ Building Relationships. Becoming a member of different organizations in your community is a first class way to meet people, form relationships both personal and professional and build trust. These can be sales organizations, lead generating groups, the chamber of commerce for your town, even the garden club! Get out there and get involved. Just by osmosis, people will start to know who you are and what you do! #6 ~ Asking for the sale. This is not an approach I have ever heard a sponsor or anyone in the business mention or teach. What a fantastic idea. A warm approach to a warm market that most probably will turn into referrals and optimally your team member. Thanks for sharing Big Al with us, Chuck. If you don’t ask for the sale you are wasting your time! It just amazes me how many network marketers and salespeople have such a problem asking for the sale. Prospects are waiting for it and if you don’t ask for the sale, you are shooting yourself in the foot; but still people are scared to do it. I wonder why? The most a person can say is no; but for some odd reason humans fear asking for a sale. In my days of high pressure sales, we not only asked for the sale, we put the pen in their hand to sign the contract. Success will be fleeting if sales are not requested. If you can’t ask for the sale you are wasting your time. The fact that prospects will only remember bits of your presentation is why your content has to be up to par. What you don’t want is for the content to be so poor or lacking in information that people focus on petty things like when you messed up a word or the fact that you didn’t really tell them anything. It also helps to be very engaging when you share your information. Attention spans are short and people to some extent need to be captivated by who you are as a person and how you present the information to even care about what it is you actually say. Most people don’t need tons of information or details to make a decision. There is no point to give anyone information overload. I really like #6. Just asking friends and family to buy 1 product to help is a great idea. This is getting the products in their hands to try, and helping you. As they see how good the products are, you can then show them how to get them at a lower price.